Visitors wanting to see this year’s epic fireworks display in Battersea Park are being reminded they will not be able to buy tickets on the gates. Tickets for the Battersea Park Fireworks Display this Saturday (November 3) must be bought in advance. This is to prevent overcrowding and ensure spectators can enjoy the display in comfort and safety. Gates for tomorrow’s display open at 6pm, at which time there will also be a bar, food and laser acts on offer. 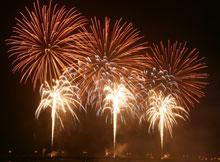 The bonfire will be lit at 7.30pm and the fireworks display will begin at 8pm. Anyone planning on going to the London Celebrates-themed display, which is fired by award-winning pyrotechnicians Pains Fireworks, will be able to buy tickets on the day between 8am and 3pm. They can be bought at Albert Gate, Chelsea Gate, Rosary Gate or Sun Gate. Tickets already purchased online or by telephone – or those bought before 5pm today using one of these methods – must be collected by 12pm on Sat, November 3, from the above gates. Tickets bought on the day will cost £10, but anyone buying them today can get them for £8. By visiting Battersea Park Millennium Arena, until 7pm. In person only. By visiting Pump House Gallery, until 4pm. By visiting the Albert Pub in Albert Bridge Road. Online (£1 admin fee per transaction) via www.wandsworth.gov.uk/fireworks or by calling 020 8871 8677 (again there is a £1 admin fee per transaction). Tickets can be bought online or by phone until 5pm today. When collecting tickets you must bring a document with proof of your name and address, such as a utility bill.